Are you looking forward for the answer on how to set goals or how to determine financial goals or how to achieve your goals in life or important guidelines in setting financial goals? 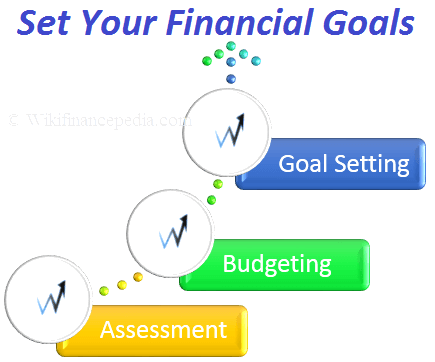 Then here in this financial planning e-learning tutorial chapter we are going to learn step by step about setting financial goals. For every personal financial goals are divided into short term financial goals and long term financial goals. So firstly we will need to perform personal financial assessment and then prepare a plan for personal budgeting to achieve financial goals in your life. Firstly we will go through financial assessment of an individual and then how to set personal budget. With the help of this ways we will be in a better position to determine and set our financial goals. Let us see this in detail. Assessment is the first step towards setting and determining financial goals in our life. Assessment of person’s financial situation is the process of compiling simplified versions of financial statements like cash flow, balance sheets and income statements. A personal balance sheet involves assets like stocks, car, clothes, house, and bank account along with personal liabilities such as credit card debt, bank loan and mortgage. A personal income statement lists personal income and expenses. Such financial assessment is used to evaluate an individual’s contribution towards your income versus expenses. A person earns INR 50,000 and he plans his personal budget in an order where he can contribute 20 per cent into savings and 80 per cent into expenses, this is a basic example of financial assessment. Such kind of financial planning will be much beneficial in his lifetime then the person who is fails to conduct wealth management for him. Budgeting is the second step towards setting financial goals. A personal budget is a finance plan that allots future personal income towards expenses, savings and debt repayment. Past spending and personal debt are considered when creating a personal budget. There are several methods and tools available for creating, using and adjusting a personal budget. For example, jobs are an income source, while bills and rent payments are expenses. The purpose of a personal budget is to determine the income and expense, and come up with a strategically sound plan to incorporate maximum saving for future events. The budget should be really simple so that it is easy to keep with, and should be flexible so that it can incur any emergency situation. This is the final step towards setting financial goals. Setting some primary financial objectives or goals is really important, because only our goals keep us moving in the right direction. Everyone has set some goals for their lives, the primary goal of financial planning for some of us is to retiring early and building a dream house, some of us want to pay for children’s higher education while some of us want to pay our entire mortgage and be debt free. As mesmerizing as it sounds, let us not lose the touch of practicality. When you define your financial goals, there are a few things you should keep in mind. Your plan should be detailed featured with all your needs and requirements. At the same time it should be flexible, so that you can alter it with respect to change in time and your needs. Never be unrealistic while you set your financial goals, sense the reality and then determine your reasonable arguments. Just to ensure as to whether or not you’re on the right track, set some short run milestones for example you wish to save INR 5,00,000 in 5 years to start your own business. So, what you can do – rather than setting such a large number as your financial goal, break the amount into smaller milestones. Your goal is to save INR 1,00,000 in one year. Your goal is to save INR 8,000 every month. 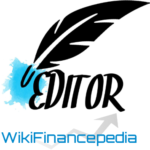 You need to save INR 1,750 every week. Now, you have gain good knowledge on how to set your goals in life whether its a short term financial goals or long term financial goals. Hope this lesson has explained you how to determine your financial goals. So now go-ahead and start setting your individual goals. Best of luck !